Thallus: peltate, often widely scattered, orbicular convex, up to 2 mm diam. ; margins: smooth, entire to slightly lobed, upper surface: dull greenish-olive, brown to black, not sorediate upper cortex: not developed but with a yellowish epinecral layer medulla: composed of loosely interwoven hyphae; algal layer: 90-120 µm thick lower cortex: 24-36 µm thick, 3-5 layers of cells lower surface: paler than the upper surface, attached by a central umbilicus Apothecia: 5-20 per squamule, immersed; disc: initially punctiform, later slightly expanded, 0.1-0.2 mm diam. ; epihymenium: yellow to yellowish brown, K+ red-violet or K-; hymenium: I+ wine-red or blue asci: clavate to obclavate, >100-spored ascospores: ellipsoid to bacilliform, 5-7 x 3 µm Pycnidia: immersed, spherical conidia: fusiform, 2.4-3.1 x 1.2 µm Spot tests: all negative Secondary metabolites: none detected. Substrate and ecology: on both acidic and calcareous rocks in deserts and other open, arid habitats World distribution: SW North America to southern Mexico, Australia, and the Cape Verde Islands Sonoran distribution: rare in desert areas of Arizona, southern California, Sonora and Baja California Sur. 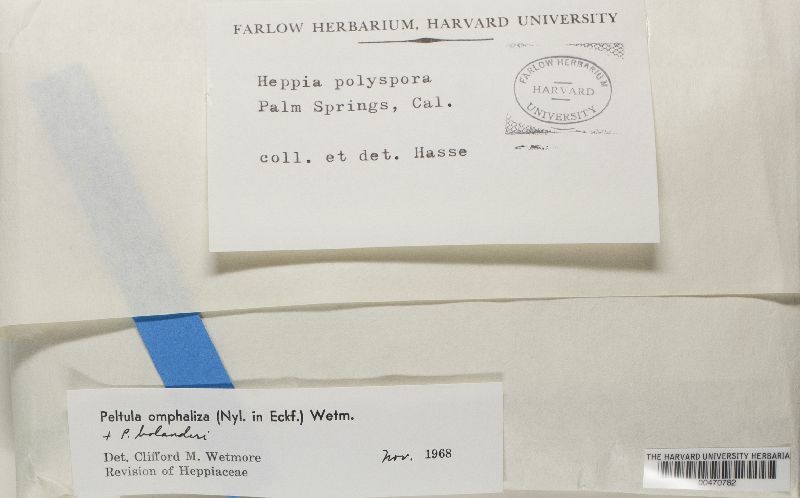 Notes: Wetmore (1970) reported specimens of P. omphaliza reaching a size of up to 4 mm diameter. However, we have not observed such large specimens of that species. All the material we saw, including the type material, never was larger than 2 mm in diameter. We suspect, therefore, that his circumscription of P. omphaliza included the more recently described P. sonorensis, which can reach or exceed 4 mm in size. Although young thalli of P. sonorensis may easily be mistaken as P. omphaliza based on size alone, P. sonorensis is always a very shiny spcecies and P. omphaliza is quite dull.